Not only will I show you how to change various different key fob batteries, but also I will show you what to do if your batteries are thinner in thickness, thicker in thickness, or smaller in diameter. This will help you to save money if you have some batteries of a different size that you bought for some other product that you no longer own. No one wants to waste them. Disclaimer: This DIY is for DIY knowledgeable people, especially in the case of a smaller diameter battery. I accept no responsibility for any loss or damage whatsoever resulting from reliance on any method contained in this video. Not only I am going to show you how to change them, but also how to use the wrong sized battery. That will save you money, I promise. This is the fob for a Lexus IS 250. First, you have to open it. Remove the mechanical key if it is hidden. The black color makes it hard to see, so let me use a white wire to point to the slot in the middle. You can use a screwdriver or that mechanical key to pry it open. There are tiny clips holding the battery in place. Pull back very slightly on a couple of them to release the battery. This battery is a CR 1632 C indicates lithium, R is round shaped, 16 is for 16 mm diameter, 32 is 3.2 mm thickness. If you have a spare CR 1632, you can just slip it in, snap the two pieces of the fob together again, and you’re done! 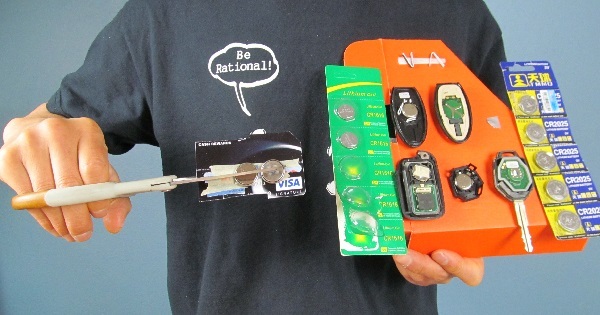 But what if you have some batteries of a different size that you bought for some other product that you no longer own? No one wants to waste them. I bought five of this size because the cost was just a little bit more than buying one. But the size is CR 1616, 16 mm diameter, 1.6 mm thickness. So it is the correct diameter, but thinner than what the key was designed to use. I am going to show you how to use this battery anyway. Now let’s look at this Subaru key. I pry this slot with screw driver, and it opens. It takes a CR 1620 battery. Now look at these contacts for negatives, this kind stands out and can tolerate larger variations in thickness. We can simply put in this CR 1616 in, and test it. Since there is no visible light when the key is pressed, therefore we should go near the car to test it. Now testing, the new battery with 1.6 mm thickness works. Basically, when changing a battery, there are three things you need to match. Voltage, diameter, and thickness. Voltage should be 3 volts. This is specified on the package, and you shouldn’t use something of a different voltage. But you can use something with different diameter or thickness. I’ve just shown you that a thinner one can work. Now I’m going to show you how to use one with a smaller diameter. This is a Nissan Leaf key fob. It takes a CR 2025 battery. I have shown you how to use a thinner battery. This is a CR 2032, a thicker battery. I have tried it without problem. I am going to show you how to use the smaller diameter battery for this key. Using a battery with different diameter is a bit harder than using a different thickness. 1. don’t need to connect every single contact. 2. do need to connect at least one positive contact. 3. do need to connect at least one negative contact. 4. do need to connect at least one contact between the two halves. This is true for the Nissan key and subaru key, but not for the Lexus. One last thing, don’t panic if the battery is dead. Watch my other video which demonstrates that without a battery, you still can enter your vehicle, you still can start the engine, although the key’s range is much shorter. Some viewers said the thicker Sunbeam (made in China) CR2032 did not work with the Nissan key fob. They said the unlock button worked but the panic button did not. But with other brands of CR2032 batteries, all buttons worked. If someone has Sunbeam 2032 or any other battery that did not work, it would be interesting to actually measure it to confirm whether or not it is 3.2 mm. I suspect they are larger than 3.2mm. So far no one has experienced any damage to the fob due to a larger sized battery. One side of the PCB (printed circuit board) contains the negative battery contacts. I looked at the other side of the PCB. a. There are four small switches soldered on the PCB. Each switch protrudes 2.4mm above the PCB. You have to press hard to hear the clicks (which means the switches are turned on). b. Next to the PCB is the rubber padding with four wells (the well is 1.4mm deep). d. since the well is 1.4mm deep and the the switch protrudes 2.4mm, the top of switch must be pressing into the rubber for 1mm already. However since the switch needs to be pressed pretty hard to turn it on, this 1mm is just built into the tolerance. e. The four switches are aligned with these four wells. The door unlock button is at the center, the thickest (14.1mm) of the fish body. Since the center is higher (see f), there is more space in height. Thus if the space is really tight, then first that will stop working will be v., the panic button. The next to stop working would be either the lock or charge_hold. The unlock will be the last. Some people reported with Sunbeam 2032 the unlock worked but the panic did not. I think this explains the reason. Anyway, I don’t think a thicker battery would damage the fob, but it could prevent the panic key from working. So my advice is, if you are able to close the halves, try to push the buttons, if you hear the clicks sound, it should work. If you hear clicks for unlock but don’t hear the click sound for panic, then you can add some padding between the rubber and the plastic casing, it should prevent the switches from being pushed too far into the rubber well.